Charles Spurgeon wrote these classic, one-page daily devotions to be read each morning and evening to encourage his fellow believers. Each meditiation is founded on a single verse of Scripture, inspiring and exhorting readers to rely upon God's care for people and to respond to that love with ever deeper service. 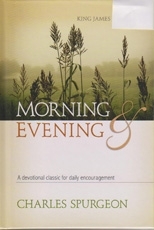 Special Features include a two-page spread for complete ease of use, inspiring meditations on portions of Scripture drawn from every book of the Bible, a new topical index helping readers to discover Spurgeon's thoughts on various topics important to Christian life and an index of texts lets readers find what Spurgeon had to say about a particular Bible verse.